If we didn't have chickens to feed our scraps to, do you know what I would do? Buy a bunch of worms and put them to work. I know very well that this isn't a new idea, but it wasn't until we saw our friend's set up about five years ago that *I* became aware of it. Then, just last week, we watched a movie (or is it a documentary?) about a couple in New York City who decided that for a year they would have no impact on the environment. Think on that for a second. In the movie/documentary they obtained worms and started their own worm-powered method of composting. It's really fascinating. 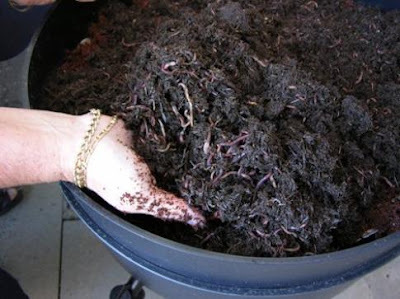 If you don't know what I'm talking about, check out this article on what a wormery is and how it works. The process is referred to as vermicomposting. And, if you're interested in that movie/documentary, it's called No Impact Man and Netflix carries it. Do any of you use worms in this way? Do you wish you would or could? The family in No Impact Man lived in a teeny-tiny city apartment, so there goes that excuse. If for some unforeseen reason we lose all our chickens, I'm calling in the worms for sure (after I bawl my eyes out, of course). In other news, more vegetables have made their way out of doors to harden off (read the last installment of Vegetable Gardening 101 for more information). We have had to cover plants a couple times because of threat or actual frost, but so far everything is fairing just fine. 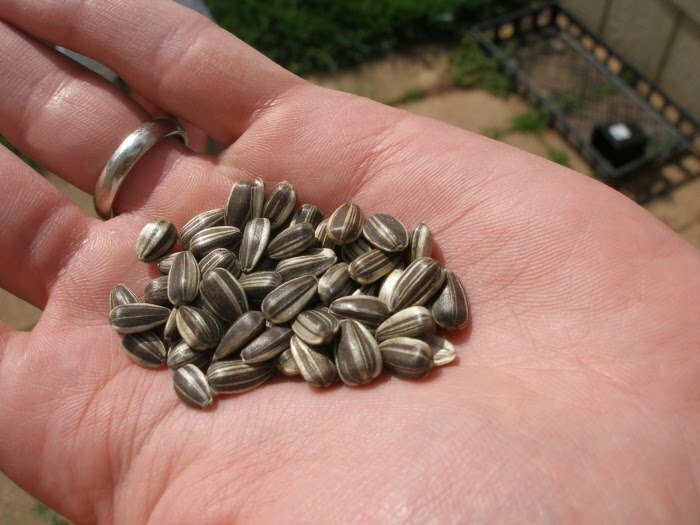 There are seeds nestled in the sunflower plot and germinating! 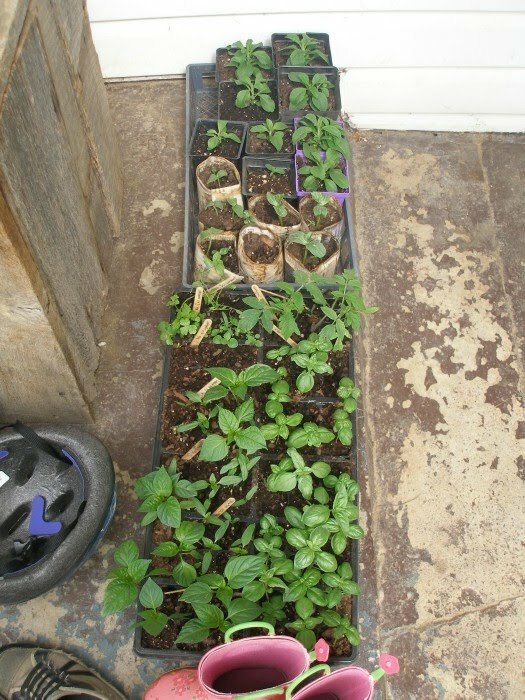 My brother is planting them in intervals of two weeks. By the time his 5th planting is in, the first planting should be ready for cutting and selling. Here are a few photos of the planting and the bed's current state. Oh, how I love to mow around this bed. I'm totally serious. I LOVE it. If you have no idea what I'm talking about, read here. My sister in law using an old wheel hoe that was my grandfather's to prepare the soil (They did use a gas-powered tiller to do the brunt of the work). 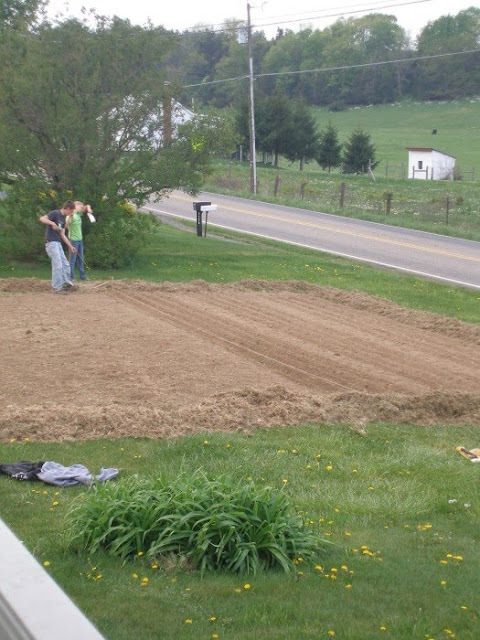 Phase one complete (view from our front porch). Grow babies, grow! I"m just waiting for someone to drive off the road as they stare at our lawn (or lack there of). I hope they don't, but it may just be inevitable. Very cool! We just got a vermicomposter for Christmas. We named the worms Fred. Or Frederica. So far it has been a bit slow to get going, but we've only had it up and running for about a month now, and it's supposed to take a few months before they can really deal with the waste in any kind of quick time. We love the idea, though, and look forward to being able to compost more and more of our kitchen scraps! Rob had a compost pile going at one time, but he never really tended to it, and it is just another place in the yard to grow weeds at the moment. :0/ Oh, well. Keep your fingers crossed that Fred (and Frederica) will do the job!! This is really interesting... something I've thought about but haven't researched much (vermicomposting that is). I've added the movie to my Netflix que so I can learn more. Thanks for passing along the info. Love your view - SO GREEN! I miss that living out west. The good news... I have lots of rich black dirt and many earth worms. I would love to have a vermicomposter in fact I saw one in our local garden centre yesterday shaped like a beehive - soooo tempting, except for the price tage! How wonderful it will be for you to see those sunflowers growing every day AND no longer having to mow that patch of grass!!! This was such a timely post for me! I was just reading about vermicomposting last night! I am becoming so aware of the apple peels, banana peels, etc. that are being thrown away or down our drain, and I am currently researching composting. Thanks for the links! First let me say that I really enjoy the information provided in your "Gardening 101" section. Also, we recently watched "No Impact Man" and found it to be most interesting, I enjoyed the realness of his and his family's endeavour. Oh, how I love that garden picture! 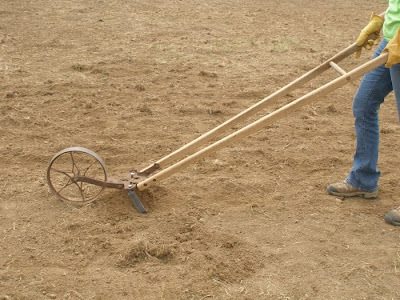 Is there anything as inspiring as freshly tilled soil? Love it. Love your blog! I've read and read and am just SUCH a fan!